Finding a new species of animal? I was hooked before I even began! The story of the olinguito begins over a decade ago with a scientist looking at pelts and skulls in a museum. He notices that some of them look different from the other olingos with which they are stored. Through careful scientific comparison at over 75 museums around the world along with DNA analysis, he is able to prove that there was an entirely separate member of the raccoon family no one had ever identified before. 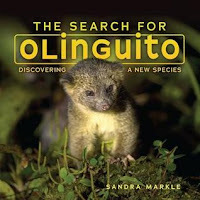 But does the olinguito still exist? Now the footwork in the cloud forest begins. The story of the animal is interesting but the real star of this book is the exacting scientific process necessary to prove olintuito exists and to identify its habits.